The year 2014 was especially busy for me in my day job and life. Although I’ve been doing almost daily posts in the Men’s Adventure Magazines Facebook group and on the Weasels Ripped My Book Facebook page, I haven’t had time to do a lot of new posts on this blog. I hope to get back to doing more frequent posts here in the coming year. In the limited “spare time” I’ve had over the past few months, I worked with my co-editor and publisher at New Texture books, Wyatt Doyle, to finalize the full color ebook edition of HE-MEN, BAG MEN & NYMPHOS, our anthology of classic men’s adventure stories by the great Walter Kaylin. That book is the follow-up to our WEASELS RIPPED MY FLESH! collection, which we co-edited with writer and musician Josh Alan Friedman. A full color print version of NYMPHOS will be available in January. I’ve also been working with Wyatt and writer Dave Coleman, the author (among other things) of THE BIGFOOT FILMOGRAPHY, to put together the next book in what we’ve dubbed the Men’s Adventure Library series. This one will feature vintage men’s adventure magazine stories about Bigfoot, Sasquatch, the Loch Ness monster and other legendary creatures from the realm of cryptozoology. I gave a preview of our forthcoming CRYPTOZOOLOGY ANTHOLOGY in a previous post. It will be published in full color print and ebook formats early in 2015. 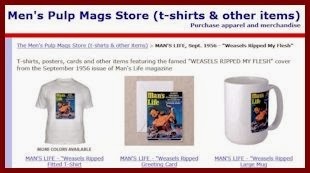 In recent weeks, I also added some new items in the MensPulpMags.com CafePress store. 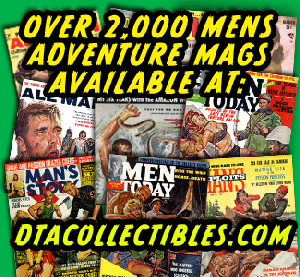 I’ve been selling t-shirts, coffee mugs and other stuff that features illustrations from some of my favorite men’s adventure magazines for a while now. But I didn’t have any calendars in it. So I designed three for 2015. One is a calendar that features Eva Lynd, the legendary actress, artists’ model and glamour photo girl I’ve written a series of posts about here. 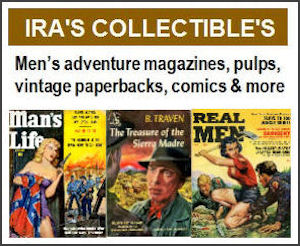 Eva was used as model for cover and interior paintings done by a number of great illustration artists, including three of the top artists who worked for men’s adventure magazines: Norm Eastman, Al Rossi and James Bama. She was also a favorite model of some of the great pinup photographers of the 1950s and 1960s, such as Peter Basch, Wil Blanche, Earl Leaf and Jerry Yulsman. Back in 2013, after I did my first couple of posts about Eva, she gave me a very big and wonderful surprise by contacting me. We’ve kept up a regular correspondence since then. I’m proud that Eva approved and authorized the Eva Lynd Calendar I created and I’m extremely happy that she told me she loved it when she saw it. I gotta say, I love it, too. It’s quite classy, like Eva is. 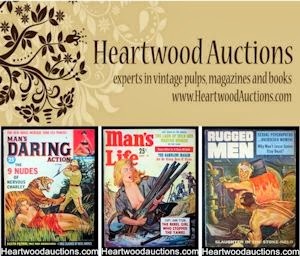 It showcases some of the excellent glamour girl photos that feature her, as well as some of the classic men’s adventure illustrations she modeled for. It’s an 11" x 17" wall calendar, printed on thick, high quality paper stock. I also created a Vintage Men’s Pulp Adventure Magazines Wall Calendar. 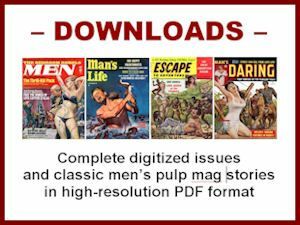 It features some of my favorite “killer creature” covers from the men’s pulp mag genre, done by artists like Norm Eastman, Clarence Doore, Wil Hulsey, Mort Kunstler and Walter Popp. The third 2015 calendar now available in the MensPulpMags.com CafePress is a Cryptozoology Wall Calendar. It was inspired by the research I did for our CRYPTOZOOLOGY ANTHOLOGY. That one features some wild men’s adventure magazine illustrations and photo spreads from stories about Bigfoot, the Abominable Snowman (aka the Yeti), Sasquatch, the Loch Ness monster, the Thunderbird, a giant squid and other crypto creatures. I’ll be traveling over the holidays, so I’ll take this opportunity to wish everyone a very Merry Christmas! And for those of you who celebrate Chanukah, here’s a link to a musical holiday treat from our friend Josh Alan Friedman from his great Josh Alan Band album.